1624 Pro Medium Engraver Features The 1624 Pro Engraver is ideal for light- to heavy-duty applications in a medium-size engraving area. 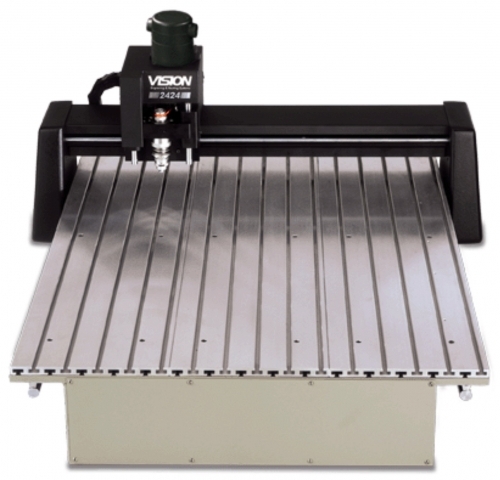 Offering a 16" x 24" aluminum T-slot table, this wood, plastic and metal engraving machine has set the precedent for quality in the industry and is designed for professional and industrial marking applications. The 1624 Pro Engraver: • 11/64” or 1/4” top-loading spindle (collet optional) • Includes NEW Series 4 Controller w/ Hand-held pendant • Engraves items up to 1.875” thick (3.5” thick or more w/ custom risers) • Optional high-speed NSK Spindle and Unist Misting System for deep metal engraving on stainless steel • Optional Automatic Raster™ Braille Inserter tool • A limited 2-year warranty Applications: Trophies, plaques, gift items, notary seals, tool & die work, tags, plates, deep metal cutting, ADA-compliant Braille signage, parts marking, plastic engraving, control panels and more! All of our rotary engraving machines are made in the USA, built to be rugged, and backed by a superior customer support team. Maximum work area 16" x 24"